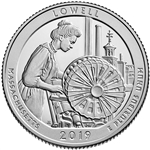 The Lowell National Historic Park Quarter is the first release of 2019 and the 46th overall in the America the Beautiful Quarters Program. 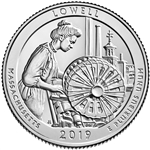 This design depicts a mill girl working at a power loom with its prominent circular bobbin battery. A view of Lowell, including the Boott Mill clock tower, is seen through the window.